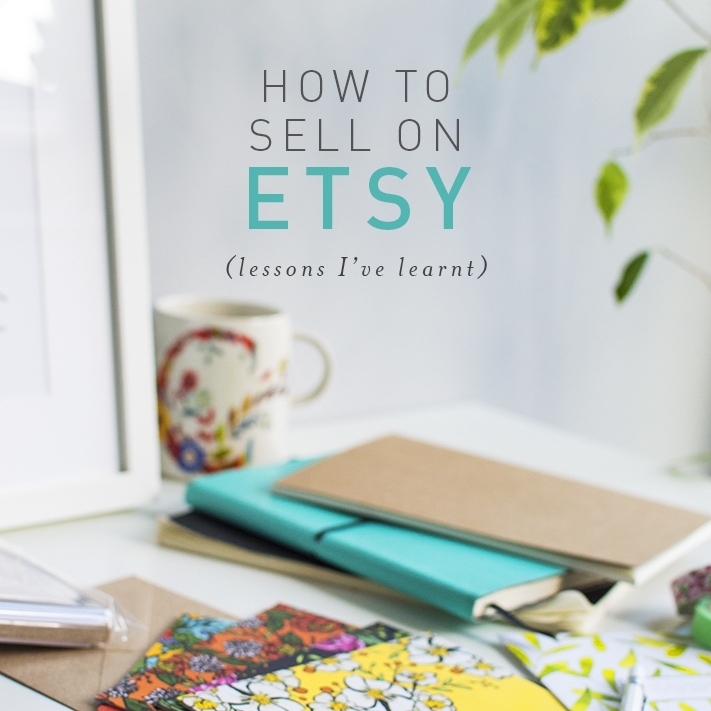 June 1st marked one year running my online Etsy shop and, as with my 6 months on Etsy post, I thought I’d round things up with the lessons I’ve learnt and the goals I’m aiming for next. It’s been a while since I’ve posted on the blog and if you follow me on social media, you’ll notice I’ve been a lot less active. In fact, I’ve stepped back from Instagram completely and posted about taking a break back in July. I’ve stopped taking on new work but I’ve still been working away behind the scenes on the ongoing projects with my clients, as well as keeping my shop open, though I’m not promoting it. I haven’t scheduled tweets or even thought about posting on Instagram because I was putting too much pressure on myself. The reason I had to take a step back in the first place was because I took on too much work while juggling my day job as a designer, and I burnt myself out. I was trying to spin too many plates and I had to stop before I dropped them all! It’s certainly not something I regret doing, and the scales have now tipped from feeling anxious about going back to posting, to feeling excited, which means I think I’m ready. Once the final two big projects I’m currently working on have wrapped up, I want to take a few more weeks off doing nothing – to find what I love and refocus what I want to do. I have so many hobbies, and it’s been really nice having more time. I’ve always felt like I’m within reach of something with my blog and online presence, though I’ve never quite got there – wherever ‘there’ is. I really want to knuckle down a schedule, plan in advance and hit the ground running, but it needs a lot of prep. This requires planning and goals, so I’ve written them down below. First though, let’s round up my exciting and busy first year in business. 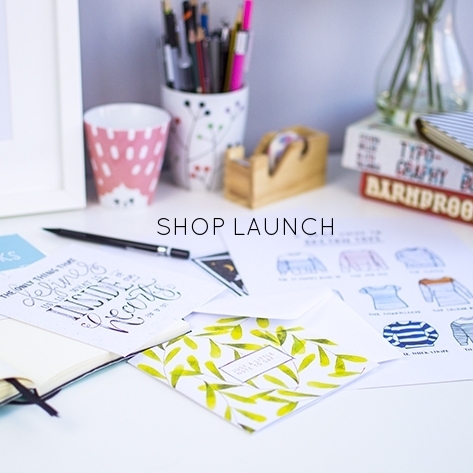 I have to say, the first year of running my Etsy shop has been so much fun. I’ve loved it – it’s felt like such a natural fit for me and the relationships and opportunities that have come out of it has been amazing. It’s always going to be difficult juggling these things around an already busy life (and I’ll come to this a bit later), but I loved the challenge of creating new products and found so many wonderful people following the same journey. 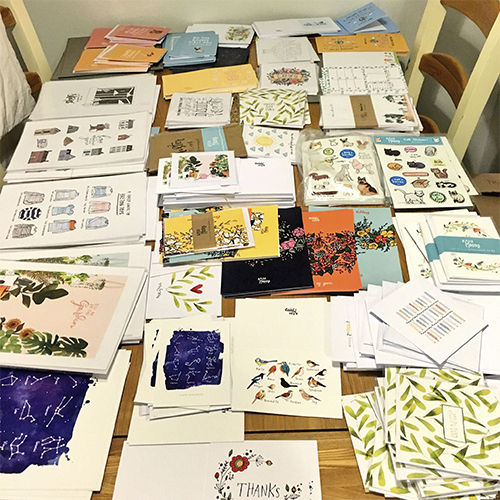 The first year (and a bit) included designing 21 new products, writing 12 monthly newsletters, almost 100 online sales and 2 craft fairs. 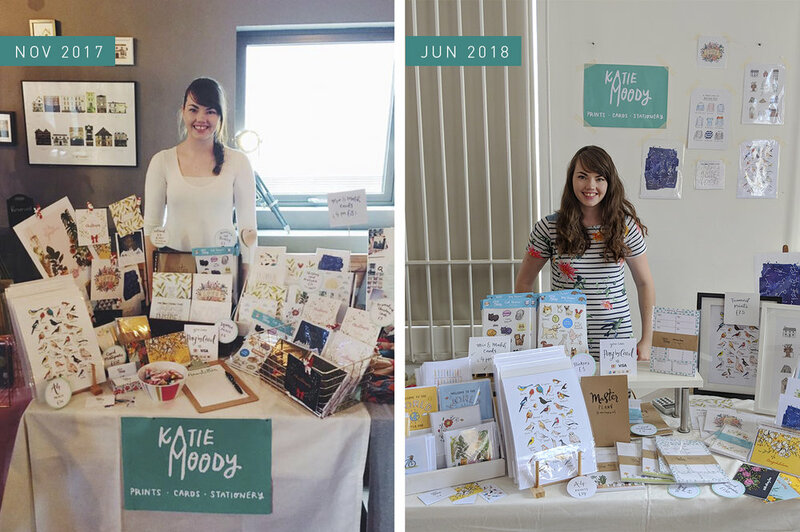 My product range has grown a huge amount – even from the craft market in November 2017 to the market in June 2018, there’s a lot more variety. My shop is still open and ticking away in the background, but after taking on a bit too many freelance jobs in May/June, it’s sat on the backburner while I take a rest. And I’m ok with it! It’s all about balance, and we can’t be running full steam ahead, all of the time. We need to rest and re-cooperate, and I’m getting excited about the new products and designs that have been popping into my head while I’ve stepped back a bit. As with all new things, there will be mistakes made and lessons learnt. I don’t beat myself up about these things, it’s one thing that I’m actually starting to be kinder to myself with. If something goes wrong, I use it as an opportunity to learn, and know what not to do next time. Postage – A (should be) obvious one, but sometimes it's easy to slip through! Always remember to weigh the items as well as measure the height, width and depth. When I launched my new memo pads in June, I used the postage setting I already had in my shop for the listings, based on my cards. They fit in the 'small letter' size of Royal Mail, but in the excitement of launching the new products, I didn't think about the weight! The extra weight meant it bumped the packages up to 'large letter', despite the size. Thankfully I realised this after taking the first batch of orders to the post office, and am putting this one down to experience! Time and upkeep – I always underestimate how long things take. Writing and photographing listings takes ages! Not only this, the time it takes to keep up with accounts and other general upkeep of a shop is also more time-consuming than you might think. One of the biggest tasks that I'm always surprised with is the packing and addressing of orders. This is without doubt my favourite bit, but the personalised notes and extra touches does mean it takes longer. It's certainly something I will have to streamline as the business grows but for now, I can keep it up with the amount of orders I receive, I just need to block out a bit more time for it. Community is everything – Lessons sometimes sound negative, because they can stem from mistakes, but this one isn’t a bad one. Honestly, community is everything when running a business. I much prefer the term community than ‘networking’, but it’s the same thing. You won’t be able to run a business, no matter how large or small, without talking to people. Not just to shout about and sell your products, but to have cheerleaders and people who support everything you create, and also, other business owners/creatives who just get it. People that you can ask for advice about where to get packaging, how much to take on cash floats and also receive honest opinions and feedback. It’s not a one-way street – comment and engage on the work from artist’s you admire, reply to your comments and buy from other small businesses. Community is without a doubt the best way to learn. This is quite a big goal for me, because it’s something that’s always been in the back of mind! I love writing and creating content, but it often gets pushed to the bottom of my list because I prioritise other things. (You'll know this if you read my 2018 goals because... two posts a month on the blog seriously didn't happen!) I’ve got so many ideas but it’s about getting serious with my own deadlines if I want to get back to sharing them. I’ve wanted to be consistent with blogging for so long, and I do think that it will help with not just my traffic, but also my audience engagement. I also felt a bit icky about sharing my blog posts on my Instagram, but I’ve had a mini epiphany while writing this. If I don’t share or promote my content, how the heck will anyone know it is there?! Duh, Katie! Time to stop worrying and self-promote. It won’t get found itself! 2 – Plan out the basis of my Instagram content but try not to worry about the likes! (I don’t want to take away the spontaneity of posting on Instagram, but I do want to relieve the pressure I put on myself when I feel like I really should post something, and then struggling to know what to share). It’s hard to not focus on the numbers, but it really does take the joy away from posting for me. I’ve read a lot of things recently about focusing on the comments and, more importantly, the community instead. An engaged audience of 100 are more likely to bring you joy (and sales) than a distant, face-less audience of 10,000. Slowly but surely, I’m sure I’ll increase my following – but I would rather have it increase gradually with more engagement, than have a ton of followers and no more interaction. Get back into creating new products and writing the newsletter, but don’t worry about creating these every single month. It was a great way to increase my product range, especially as it was my first year, but creating new products and designs each month took a lot of time (and money). I still want to expand my offering, but it’ll be less often and more thought out when I do so. I also really want to do wholesale. This has been a biggie on the list for a while, but I’ve always been scared about doing it and not really known where to start. There’s a great resource called ‘The Indie Retail Academy’ which talks through the process and some really excellent tips and help for starting out. I just need to put aside some time to read through it, do some research and apply it! I do think this is the next exciting step for the business, though. There is a common theme in writing out my goals and that is pressure. I put way too much pressure on myself – I expect myself to do rather a lot and all the stress comes from me, rather than external sources. My goals are not set in stone – they include words like try and, reading it back, a lot of 'don’t worry's! I am trying to stop setting unrealistic goals for myself and, instead, take it slow and steady and do what I can. This break has done me the world of good, so if you’re feeling overwhelmed and overworked, I recommend it. The world still turns and your followers won’t disappear, so remember to look after you. We don’t have managers telling us to stop and take a break, because we are are own boss. It’s important to work hard, but not to the point of exhaustion and certainly not to the point where we are doing ourselves more harm than good. 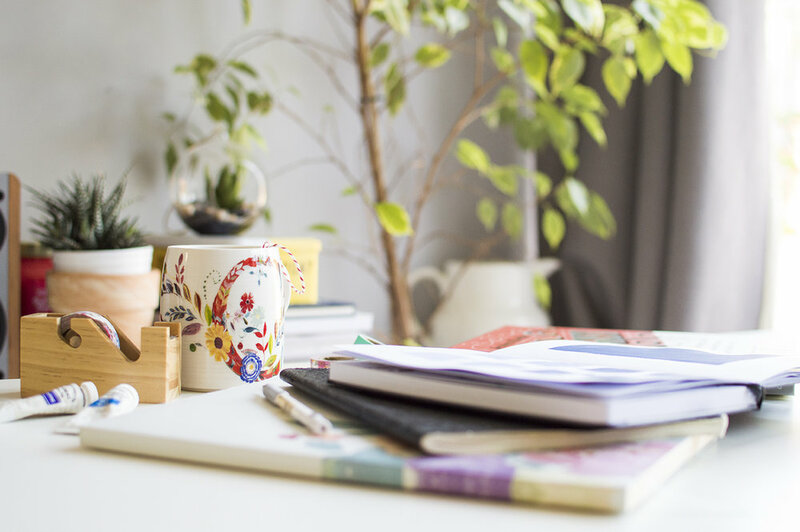 Self care has become a bit of a buzzword lately but it’s so important to give time to ourselves, as well as our business, no matter how fast we want to grow, or how much we want to succeed. I love setting goals and resolutions for the year ahead and talking about my business really lights a fire in my belly. I'm excited to see where the next year takes me! If you'd like to follow along on my journey, you can find me on Twitter and Instagram.